Idles about. Occasionally stunned, falls apart, and then reforms. Ignites the caster, causing them to deal 98 Elemental damage to the current enemy pet every round. Lasts 9 rounds. 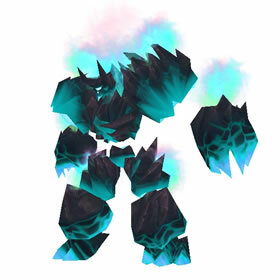 After 2 rounds, the ground erupts for 2 rounds, causing the current enemy pet to take 334 Elemental damage and have a 25% chance to be stunned for 1 round. On the next round, you impact, dealing 591 Magic damage. Needed for the Raiding with Leashes III: Drinkin' From the Sunwell achievement. This rewards the K'ute! pet. If you're in a rush you can locate one on the AH. I prefer to earn them one by one. Takes alot longer for sure. I like that this pet gives off a glow that lights up your character when you stand close to it. I wish the Netherspace Abyssal had that too. The deconstruct and reconstruct animation is a bit silly to be honest, but its still better than just standing around. (yes im looking at you Minfernal). I really like the Infernal Demons, but unfortunately i havent been able to build a good team with or around them. But writing this comment makes me want to experiment with them again. 2 on 4 runs. And I love how this pet looks. Amazing visual and animations, and a good pet battle too. Casting Volcano, Scorched Earth, Immolation and then swapping out to a pet that can cast Plagued Blood (Or Son of Sethe with Both PB and Touch of Animus) will allow your Abyssius to sit in the back ground and heal for each time the enemy pet was hit. Or you can skip Volcano and start with a Meteor Strike opener for the most damage. Ran all 3 raids on my lvl 100 mage and not one single pet dropped :( Sad times lol. 'Raiding with leashes II' seemed to have quicker drops. I got him on the fourth run:) he is so cool looking can't wait to try him out :). OKAY so his first spell is Immolation so I had used another pet to help level him. There are a few new pets like this. Is this becoming a new trend? I got mine, first try. Wife got hers on her first try as well. For those unfamiliar with BT, he drops from the second boss. The first boss also drops a pet. Got this pet the first week it came out and levelled him up to 25 and found his moves powerful but at the same time nothing special. I'm sure there is a playing style suited with him and a team that can intertwine with his cool downs but I don't really like the moves at all. Just got this guy on my first try, he is very loud about the same as a warlocks infernal and he crumbles down and builds himself back up again, pretty cool. Just got this guy on first post-patch run. A fragment of the great abyssal Supremus, Abyssius contains enough fiery essence to burn a hole right through your pocket.